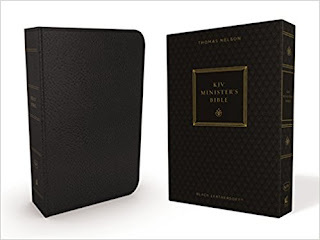 Pastors stand ready to meet the needs of their flock at a moment’s notice, and Thomas Nelson's KJV Minister’s Bible is here to help. 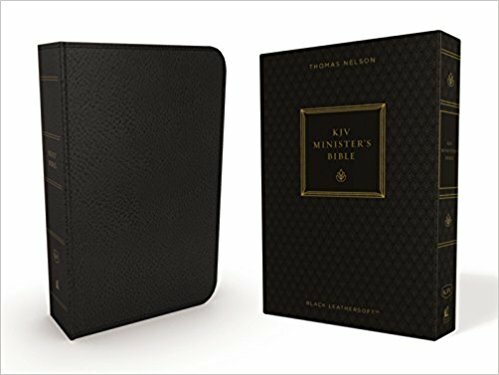 With the complete Nelson’s Minister’s Manual conveniently set between the Old and New Testaments, you'll find sermons, readings, outlines, prayers, and more quickly and easily accessible. This Bible is a one-stop resource, offering time-saving direction for weddings, funerals, communion and baptism services, confirmations, dedications, and a variety of other pastoral care situations. My thoughts (reviewed by Steve) As a minister, there is no such thing as too many Bibles. “Specialty” Bibles are a real treat, and The KJV Minister’s Bible is no exception. The LeatherSoft cover is soft and supple to the touch, and yet feels very secure in the hand. I would feel very comfortable holding this Bible open in one hand, while preaching. For the most part the KJV Minister’s Bible lives up to the claim of “lay-flat” binding . . . when one gets to Revelation, some “pressing” is required, which is to be expected. I also enjoyed the “clean” text of the Scripture passages. While I have a Thompson Chain Reference, and love it for the copious cross references and margin notes, sometimes it’s refreshing just to get alone with God’s Word, minus the distractions. This is a three-ribbon Bible, which means you can easily mark your place for different portions of Scripture, depending on the service. I’ve only noted two issues with this KJV Minister’s Bible. I like to mark up my Bible . . . a lot. The highlighters I use seem to bleed through more than I would like. And the one feature that I sorely miss: a concordance. For the serious student of the Bible, a concordance is indispensible. All those positives – and only two drawbacks – make this a Bible that I feel is well worth the purchase price. Nice review of The KJV Minister's Bible by Steve.Yeah to it being in the KJV.